Ever since Amazon released their new 10-inch Android tablet, the Fire HD 10, I’ve been saying that it isn’t a good buy. 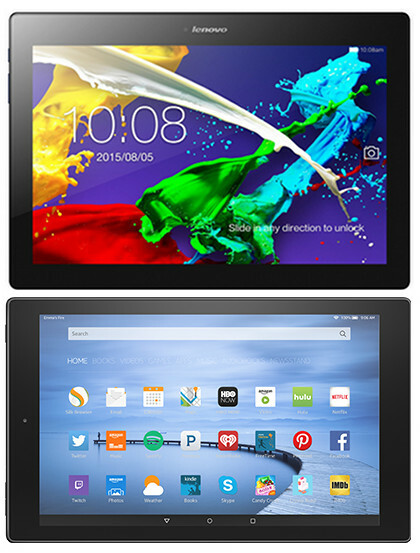 There are better tablets on the market for the money, namely the Lenovo Tab 2 A10 tablet. I just posted a Lenovo Tab 2 10 review a couple days ago, and there’s no question that it has the Fire HD 10 beat every which way. The specs are superior, the operating system is more open and customizable, and the price is considerably less. The Fire HD 10 only has a few advantages in that it is directly tied to Amazon’s ecosystem, and that includes a few exclusive perks. On the surface the Fire HD 10 looks like a pretty decent tablet. But there are two big cons, the low resolution screen and the price. The Fire HD 10 has the lowest resolution screen that you’re going to find on a tablet in this day and age. At 1280 x 800, it has 149 pixels per inch. To put that in perspective, the Kindle Paperwhite 3 has 300 ppi and the older generation Fire HDX tablets had over 320 ppi. Even the very first Kindle Fire tablet had 169 ppi. At $229 the price of the Fire HD 10 just doesn’t make sense either, especially when you factor in the fact that it comes with screensaver ads at that price. Add $15 more to remove ads for a comparable price of $245 vs $199 for the Tab 2 10, which often goes on sale for $179 to boot. The thing is, Amazon priced the $49 Fire tablet so low that I think they are trying to make up for it by charging more for the Fire HD 10 than what it’s really worth. Higher resolution screen (75 more ppi). Twice as much RAM: 2GB vs 1GB. Battery life rated at up to 2 hours longer. Open Android operating system with more features and customization options than Amazon’s custom OS. Lots more Android apps: officially supports Google Play Store and Google Apps. Slightly faster processor max speed: (1.7 GHz vs 1.5 GHz). Costs at least $30 less. Can install Amazon apps to get most of the same services as Fire HD, such as the Kindle app, Amazon Underground, etc. Tighter integration with Amazon’s services. Amazon videos available in SD or HD (Amazon’s Android app for tablets and phones uses SD only). Borrow a free Kindle ebook per month from the Kindle Owners Lending Library. Mayday button for instant customer support 24 x 7, 365 days a year. X-Ray for movies (see trivia and character backgrounds, etc). Thinner: 7.7 mm vs 8.9 mm. Lighter: 432 grams vs 520 grams. Probably more durable given Amazon’s claims that it’s almost 2x more durable than the iPad Air. Note: I thought the Fire HD might have had an advantage with support for 128 GB microSD cards; Lenovo doesn’t specify if 128 cards work but it turns out there are memory cards made specifically for the Tab 2 10 at Amazon up to 200 GB. In my opinion, the 10-inch Lenovo Tab 2 10 is a much better tablet than the new Fire HD 10 because of the higher resolution screen and boost in specs, the open Android OS with Google Play support, the 2 hour longer battery life, and the fact that it costs less. 1920 x 1200 resolution (224 ppi). 1.7 GHz quad-core processor MediaTek MT8165. 1280 x 800 resolution (149 ppi). 1.5 GHz MediaTek MT8135 Quad-Core processor. 720p front-facing HD camera; 5 MP rear-facing HD camera. Weight: 15.2 oz. (432 g). Dimensions: 10.3″ x 6.3″ x 0.3″ (262 x 159 x 7.7mm). Price: $229 at Amazon (+$15 more to remove ads; +$30 for 32GB). You can scratch one of those advantages off the list for the Fire tablet. There is a new Amazon video app for all Android tablets, and it lets you download movies for offline viewing as well. It is available in the Amazon app store but I do not see it in the Google Play Store. I knew about the video app but I didn’t think it could download Prime videos, but it turns out it can. According to the Amazon Video Help Page, the main difference with the Android app is the videos are in SD format only whereas Fire tablets have the option for HD, so I updated it to say that instead.